Uzbek citizens work the fields during the 2009 cotton harvest. Once again this year, the government of Uzbekistan forcibly mobilized its citizens — including health care workers, teachers and students — to the cotton fields to prepare for and carry out the 2015 harvest of the country’s “white gold.” As in the past, forced labor practices were well documented by human rights groups, including the Uzbek-German Forum for Human Rights (UGF). New to the harvest this year were monitoring teams deployed by the International Labor Organization(ILO). Despite finding numerous “indicators” of forced labor related to the widespread recruitment of adults, the ILO nevertheless concluded that it did not find “conclusive information that beneficiaries of World Bank projects used child or forced labor during the cotton harvest.” The World Bank now provides $500 million in loans to Uzbekistan’s education and agricultural sectors. Positively, the use of child labor in Uzbekistan’s cotton fields has waned (though it still exists as a byproduct of state pressure to fulfill quotas). Unfortunately, the Uzbek government used the 2015 harvest to “double-down” on its use of coercion in the mobilization of adults and increased its persecution of those seeking to document and expose the government’s forced labor practices. Worse still, according to the Cotton Campaign and other observers, the forced labor practices of Uzbekistan are now being employed by the government in neighboring Turkmenistan as well. As in prior years, the harvest plan was developed at the very top levels of the Uzbek government. The prime minister determined the quotas and distributed them to regional “hokims” responsible for imposing the quotas on farmers and other institutions. Wages paid to those involved in the harvest were nominal and substantially lower than market. As reported by UGF in its March 2016 report: “Almost universally, respondents told us they could not refuse to pick cotton.” As one person put it to UGF, “No one wants to go of their own will to harvest cotton for miserly wages.” For many, the UGF concluded, the very notion was unthinkable. Reading the UGF’s most recent report, it is almost inconceivable to imagine how the ILO could reach such a conclusion. Rather than merely “encouraging” people to take advantage of the economic “opportunity” of the harvest, the state once again drew from a well-worn playbook of fear and intimidation tactics designed to give citizens no other choice but to leave their homes and jobs to labor in the cotton fields. Operation Cleaver, an official directive from the Uzbek government, tasked officials with repossessing land and the personal property of farmers who were either in debt to government-run banks or had failed to fulfill their cotton quotas. Teachers received orders from government officials compelling them to send their students to the fields, and many students rightly feared expulsion if they refused to participate. One “urgent message” sent to a private company stated that “[a]ll organizations … must participate in the cotton harvest.” Others were threatened with dismissal from their jobs. 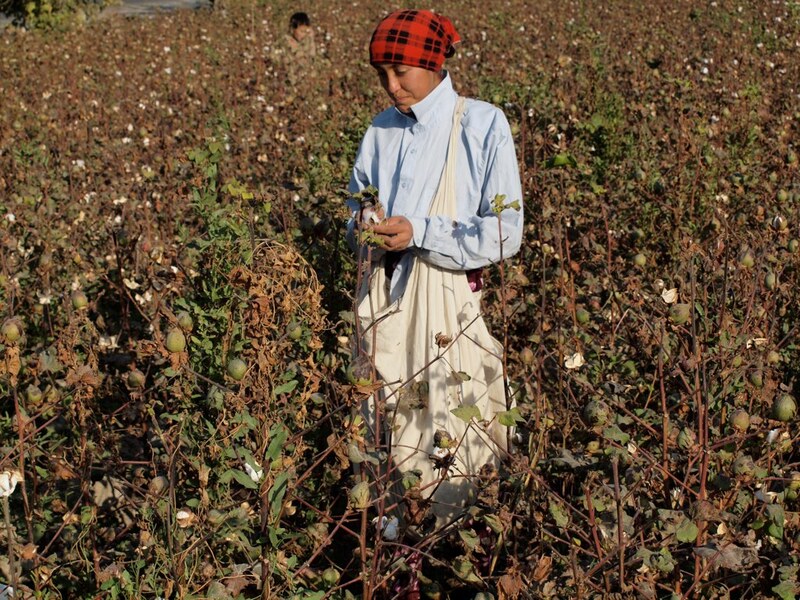 As the UGF points out, forced labor in Uzbekistan’s cotton sector must be viewed against the backdrop of the systemic repression and widespread human rights violations that occur there on a regular basis. Human Rights Watch describesUzbekistan’s human rights record as “atrocious,” and in 2015, Freedom House ranked Uzbekistan the fourth least free country in the world and the most repressive regime in the highly authoritarian region of Eurasia. The Uzbek government regularly engages in torture of prisoners and detainees; severely limits speech, religion, assembly and association; routinely harasses and conducts surveillance on human rights defenders; and lacks an impartial justice system or any semblance of the rule of law. In other words, in Uzbekistan, people are justifiably terrified of disobeying the state. Particularly in this context, police and prosecutor presence in the cotton fields reinforces a not-so-subtle message that participation in the cotton harvest is mandatory and that resisters could face severe punishment from the state. In 2015, this climate of fear was supplemented by an onslaught of propaganda about the importance of cotton, linking the resource to the the Uzbek identity. As such, there was a pervasive sense in Uzbekistan that those who do not participate are somehow unpatriotic. Cotton is Uzbekistan’s largest agricultural crop. Despite the overwhelming evidence to the contrary, the Uzbek government went out of its way to make participation in the 2015 harvest appear voluntary. According to both the UGF and Cotton Campaign — a coalition of human rights organizations, trade unions, socially responsible investors and business associations — this effort was greatly intensified in 2015 as compared to prior years. For example, UGF obtained copies of false statements from students at six different educational institutions stating that they were picking cotton voluntarily. One student even referred to cotton picking as his “internship.” Though the ILO reported that “schools and hospitals functioned normally” during the harvest, UGF found the opposite. None of the doctors, teachers or other professionals interviewed said they would rather pick cotton than do their own jobs. The 2015 harvest was also marred by a campaign of state-organized persecution of activists documenting labor and human rights issues in the cotton sector. One such activist, Dmitry Tikhonov, was one of UGF’s own monitors, and his tale — documented by UGF, the Guardian, and in Tihkonov’s own words (here andhere) — is a harrowing one. Prior to the harvest, in August 2015, Tihkonov learned that some of his friends had been questioned by the police about his work and personal life. The next month, when mobilization for the harvest was at its peak, Tihkonov was surrounded in public and harassed by a group of local officials. A day later he was picked up by police, forced to draft a statement explaining why he is “against cotton,” yelled at and beaten. A few days later, he was detained again after a questionable traffic stop. In late October, when Tihkonov was out of town, there was a major fire at his home. The fire destroyed his work, two computers, a laptop, a printer/scanner, video and sound equipment, all contacts, papers and files, $1,500 in cash savings, clothing, and his legal library. He also discovered that his hard drives were missing. Other activists were also subjected to harassment by the state. For instance, in my conversation last month with the coordinator of the Cotton Campaign,Matt Fischer-Daly, he mentioned the arrests and body cavity searches of a number of female monitors, as well as the arrest and two-month detention of a monitor who was released only on the condition that he do no more human rights work. I asked Fischer-Daly how the crackdown impacts the work of Cotton Campaign and others dedicated to exposing the crimes of the Uzbek government (UGF is one of Cotton Campaign’s primary partners). 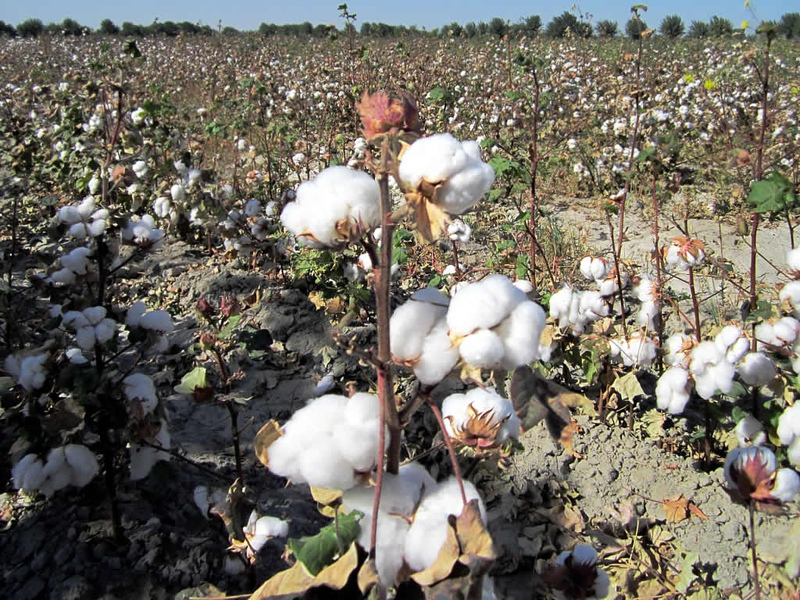 Unsurprisingly, he reported that the systematic persecution made Cotton Campaign’s work far more difficult, as much of 2015 was spent responding to acute safety risks facing the campaign’s partners on the ground in Uzbekistan. The group also had to change its procedures and can no longer conduct trainings in Uzbekistan. Yet, despite all this, the Cotton Campaign’s monitors have said they will not stop working to expose forced labor in the Uzbek cotton fields. 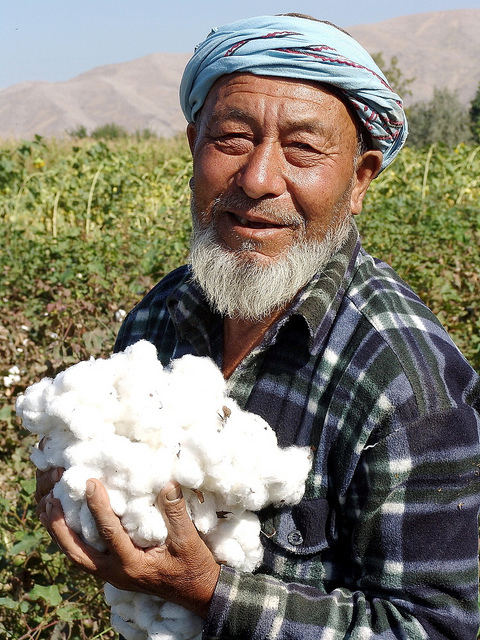 An Uzbek citizen picks cotton in 2011. In 2014, Uzbekistan signed a Decent Work Country Program with the ILO, in which it committed to work with the ILO and to apply international labor standards. The Bank also agreed to condition Uzbekistan’s loans (now amounting to $500 million) on the absence of forced or child labor in project areas. As a result of these agreements, Uzbekistan also committed to establish a “feedback mechanism” that allows witnesses or victims to report abuses during the harvest and an awareness-raising campaign aimed to educate Uzbekistan’s citizens about the illegality of forced and child labor. Yet, the ILO still found “indicators” of forced labor related to the widespread organized recruitment of adults to pick cotton and noted that “[r]obust further steps are required to remove the risk of forced labor.” In particular, the ILO highlighted several concerns “with respect to candidness of interviewees,” and UGF rightly pointed out that serious questions exist concerning the independence, and resulting effectiveness, of the ILO monitoring teams, due in part to their makeup. In the face of these admitted shortcomings, however, there is no indication that the ILO considered changing its strategy, nor does the ILO explain why it failed to do so. Moreover, by beginning its monitoring process in mid-September, the ILO missed the “massive labor deployments to the fields” that occurs in the beginning of the month, the UGF notes. As for the “feedback mechanism,” the ILO admitted that usage rates were low, and nobody interviewed by the UGF even considered using it. The reason for the poor level of participation seems to be that people feared reprisals for using the mechanism. In fact, several who called the hotline or tried to complain to the ILO suffered harassment from officials. As the Cotton Campaign’s Fischer-Daly sees it, the World Bank should incentivize reform by requiring demonstrable progress from the Uzbek government on ending forced labor as a condition for loan disbursements. By disbursing funds first, the Uzbek government has less incentive to change practices and is likely to only take procedural measures. Of course, much of the cotton harvested on the backs of Uzbek citizens eventually makes its way into the products many of us buy and wear. Groups like Sustainable Brands and the Responsible Sourcing Network(RSN) aim to educate companies and consumers about forced labor in the supply chain, and to discourage companies from buying cotton from countries like Uzbekistan. As of late 2014, I noted here on 3p that many major apparel companies had signed RSN’s pledge not to use Uzbek cotton in their products. Yet, when I asked Fischer-Daly whether apparel companies were succeeding in keeping Uzbek cotton out of their products, he noted the limitations of RSN’s Cotton Pledge. 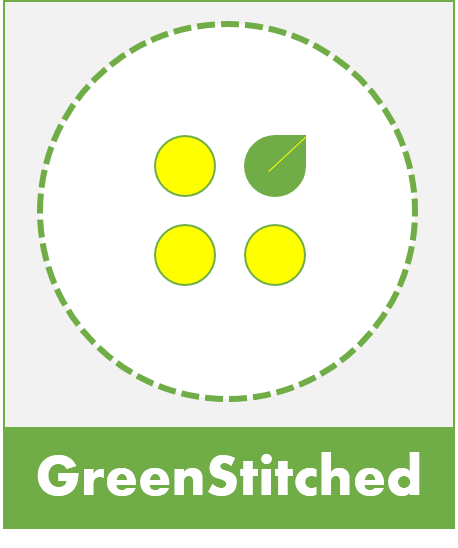 As with many products, the difficulty with cotton boils down to traceability, and many brands simply do not know the true origin of their cotton. The most successful companies are those that have direct relationships with their raw material suppliers, but very few do. In order to truly change this practice, Fischer-Daly said, brands must fundamentally change the way they source. As in Uzbekistan, the state maintains a monopoly on the purchase and sale of cotton and sets a below-market procurement price. Turkmenistan is the world’s eighth largest exporter of cotton (Uzbekistan is fifth), and the Cotton Campaign has been able to tie Turkmen cotton to Turkey, a major manufacturing hub for brands operating throughout Europe. Fischer-Daly told me the first Turkish company that Cotton Campaign identified as processing and producing garments using cotton from Turkmenistan reported that it sold to about a dozen brands. Some brands, such as H&M, have nowcommitted to excluding Turkmen cotton from their products (as H&M did with Uzbek cotton in 2013). Yet, as in Uzbekistan, without real consequences there is little reason to believe either the Uzbek or the Turkmen governments will move away from their forced labor systems. This entry was posted in Organic Cotton and tagged C&A, C&A Foundation, Cotton, Cotton Campaign, Triple Pundit, Turkmenistan, Uzbekistan. how sad, the first pic of a child .